The Great Nurdle Hunt, Reducing plastic pellet pollution at sea. "The John Muir Trust are delighted to share this project across our engagement and volunteer initiatives. It is an excellent way of raising awareness, making a difference, and giving people the opportunity for practical action." "The Highland Seashore Biodiversity Project encourages local people to take ownership of our beautiful coastline and the life that depends on it. We are sustained by our coast, keen to protect it and now fired up to look for nurdles." "The Scottish Wildlife Trust is delighted to support the Great Nurdle Hunt in tackling this important issue that will help achieve our vision of Living Seas where wildlife thrives from the coastal shallows to the ocean depths." "The Inner Forth Landscape Initiative is pleased to support efforts to create a cleaner Forth estuary landscape for wildlife and communities". 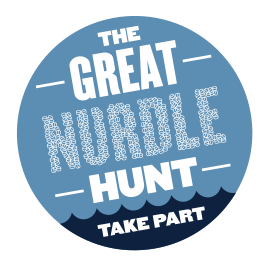 "Fife Coast & Countryside Trust are delighted to have the opportunity to help with The Great Nurdle Hunt project, helping to raise awareness on the coastal zone and creating a cleaner marine environment for the future is a priority for us all". "The Scottish Seabird Centre is proud to support this very important campaign. It is vital that we protect our marine environment now and for future generations". "RSPB Scotland is proud to support the Great Nurdle Hunt to help create a cleaner and more sustainable coastal landscape that benefits both wildlife and people". "East Lothian Countryside Service are keen to support this initiative that aims to reduce the degree of plastic which threatens the wildlife of the Scotland's seas". "We are proud to support The Great Nurdle Hunt with the aim of cleaning up Scotland's seas." "We welcome the opportunity to work with The Great Nurdle Hunt to encourage good environmental practice."